Temporomandibular joint (TMJ) syndrome can be one of the most difficult and elusive conditions to treat. Many people suffer with symptoms, such as, clicking or popping, headaches, earaches, dizziness, eye pain and neck/shoulder pain, despite years of traditional medical therapy, not even realizing, that the problem lies in their jaw (TMJ) and surrounding tissues. In order to effectively alleviate the symptoms associated with TMJ, one must use an integrated treatment approach combining various therapeutic modalities. One of the primary reasons for a poor outcome in TMJ treatment is a lack of clinical understanding of the relationship between articular (joint), muscular and neurological causes of the condition. If any of these potential causative factors are missing in the treatment approach, poor results can occur. A chiropractic physician who specializes in the TMJ diagnosis and care, and who diagnoses and treats all factors associated with TMJ syndrome, can deliver a change not only to the TMJ, but to the supportive tissue and the surrounding tissues involved with the position and function of the TMJ. Thereby, helping not only with the resolution of the symptoms associated with TMJ syndrome, but with the underlining causes for TMJ syndrome. 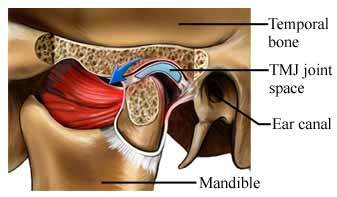 The temporo-mandibular joint, commonly known as "TMJ", is the joint that connects your lower jaw, or mandible, to the temporal bone - a part of your skull. The TMJ not only consists of those two bones, but is actually a complex of nerves, blood vessels, muscles and a cartilaginous disc. The muscles of the TMJ control the movements used for chewing, talking, and opening and closing the mouth. Because of the complexity and frequent use of this joint, it can be a troublesome area for many people. The TMJ may be the cause of headaches and neck pain and may click or "pop." Sometimes it may even lock up and be very painful and difficult to move. 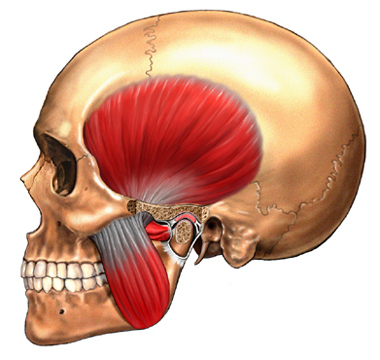 The TMJ is controlled by muscles. The muscles controlling the TMJ are predominantly the masticatory muscles including the temporalis, masseter, lateral pterygoid, medial pterygoid and buccinator. However, other muscles may have an effect on the functioning of the TMJ, such as the neck, shoulder and back muscles. This is the key area often overlooked by physicians when treating TMJ syndrome. Primary muscles include the scalene, sternocleidomastoid, trapezius, levator scapulae, supraspinatus, infraspinatus, rhomboids and latissimus dorsi. There has even been a case in which the soleus muscle affected the TMJ via kinetic-chain dysfunction. What can cause TMJ syndromes? There are various causes for TMJ syndrome, such as: changes in occlusion, occlusal interferences (changes in the dynamics of the bite), loss of posterior support, trauma, dental work, certain oral habits (clenching or grinding of teeth), disease processes, or just wear and tear on the joint, secondary to aging. Traumatic events such as a blow or punch to the jaw can break the jaw bone itself, or stretch the muscles and even injure the disc, causing problems in the joint. Birth trauma may play a role in breast feeding problems, as many unnatural births or C-Sections are traumatic to the baby's cervical spine and the TMJ joint due to the severe pull administered to the newborn's head, neck, and jaw during delivery. A traumatic event such as an automobile accident that involves whiplash can cause hyper-extension of the cervical spine. As the lower jaw lags behind in this motion, it can result in over extension of the joint itself, compression of the TMJ disc, and internal disruption of the TMJ joint. Major dental work may also contribute to problems of the TMJ. Spending extended periods of time with the jaw in a maximally expanded position puts a lot of strain on the muscles and disc in the joint. It is also possible that children or adults with dental appliances, such as braces or retainers, may have impaired bite and function of the joint that can lead to problems. Certain oral habits, such as clenching or grinding of the teeth (also known as bruxism), can cause spasm in the muscle and induce inflammatory reactions and strain on the joint. Eventually this habit can cause changes in the teeth and a person's bite itself, which will eventually cause more changes in the actual joint. Abusive oral habits or occupational conditions (e.g., holding the telephone receiver between the shoulder and ear) can irritate the TMJ and lead to TMJ syndrome. The jaw is also susceptible to degenerative changes (Osteo-Arthritis) secondary to "wear and tear", aging, or simply from grinding the teeth at night. The degeneration of the joint involves the breaking down of the cartilage and disc that serve as a smooth liner for the joint and the growth of bone that causes the joint surfaces to be more jagged, thus causing pain, clicking, and popping with movement. Certain disease processes, such as rheumatoid arthritis, may contribute to problems in the joint. This inflammatory disease, which affects most of the joints in the body, can cause destruction and erosion of the bone and cartilage of the joint, especially in children. Another common cause involves displacement or dislocation of the disk that is located between the jawbone and the socket. A displaced disk may produce clicking or popping sounds, limit jaw movement and cause pain when opening and closing the mouth. The TMJ-disk also can develop a hole or perforation, which can produce a grating sound with joint movement. Bruxism (teeth grinding) causes micro-trauma to the joint capsule, ligaments and soft tissue, leading to symptoms from active trigger points and adhesions. Other causes of TMJ syndrome include: Capsulitis of the TMJ (AKA: Retrodiscitis) and Synovitis. How do I know if I have TMJ syndrome (TMD)? A pain directly in the joint or muscles surrounding the joint (right in front of the ear) would be the first indication of TMJ syndrome. The pain may exist while the jaw is in the rested position, but most commonly it is present with talking, chewing, and yawning. The pain may not stay directly in the joint itself; it may also radiate to the face, skull, neck or shoulders. You may also experience some ear pain, or ringing in the ears. Often with TMJ syndromes a person may experience pops, clicks, or grinding in the joints when they are moved, which suggests improper positioning of the disc in the joint. Sometimes the jaw may even lock in the open position, deviate to one side or the other, or not even open as wide as possible. Headaches, with or without dizziness, are common symptoms associated with problems which originated in the TMJ even without the presents of TMJ pain. If you suspect you may be having TMJ problems, it is important to see a qualified chiropractor, who is specially trained in TMJ syndrome diagnosis & management for proper diagnosis and treatment of your symptoms. Once I find out I have TMJ syndrome, what can I do to treat it? There are many ways, to treat the joint, and a Chiropractor Specializing in TMJ conditions can help to properly diagnose and treat your TMJ Condition by aligning the cervical spine (the neck) which holds your head in a proper position for the TMJ to function and properly heal. Dr. Laub, of West Hartford Chiropractic, is one of the few practitioners in the Farmington Valley who specializes in the diagnosis and treatment of TMJ disorders. He can guide you with Chiropractic Management of your TMJ syndrome. Chiropractic care is a gentle, non-invasive way to treat TMJ syndrome. Maintaining the alignment of the spine and optimal nerve supply to the joint, along with gentle and specific manipulation of the jaw itself, will take pressure off the TMJ discs and allow the muscles sufficient blood and nerve supply to heal properly on their own. An integrative approach has been found to be the most effective form of treatment for TMJ syndrome, using a combination of specific chiropractic manual adjustments, trigger points massage therapy to the musculature, and therapeutic modalities, such as Soft Laser (Cold Laser Therapy or LLLT) and Ultra Sound. Manual muscle stimulation, in and out of the mouth, can help release muscle spasm and reduce trigger point or "knot" formation in the surrounding musculature. Cold Laser therapy provides pain relief, anti-inflammatory qualities, along with bio-stimulation, allowing for increased tissue metabolism rate and neo-visualization (promotion of new blood vessels formation), thus allowing for faster pain relief and tissue healing. In severe TMJ syndromes, your chiropractor will refer you to a dentist or orthodontist for co-management and the administration of mouth guards or bite plates. In severe trauma, your chiropractor will refer you to an oral maxillofacial surgeon for surgery. These procedures are, however, much more invasive, and it is strongly suggested that the patient try chiropractic care, as a more conservative and less invasive approach first, as there are also many risks to these other treatments. Can I prevent TMJ syndrome? It is important to take care of your jaw. Avoiding extremely chewy foods and gum will help; so will staying away from chewing on objects such as pens or pen caps. Unfortunately, traumatic events generally cannot be predicted or prevented nor can certain disease processes. Regular chiropractic care of the TMJ and alignment of the spine will also keep your nervous system working at its optimal level, helping to avoid future problems in the joints. 1. Basmajian J. Muscles Alive. Baltimore: Williams and Wilkins, 1974. 2. III Gillespie T. TMJ Anatomy. Accessed Oct. 12, 2007 from University of Washington: www.rad.washington.edu/anatomy/modules/ TMJ/TMJAnatomy.html. 3. NYU Medical Center. Accessed Oct. 11, 2007, from www.med.nyu.edu/surgery/oral/patients/ article.html. 6. Curl DD, Stanwood G. The Chiropractic Management of Capsulitis and Synovitis of the temporo-mandibular joint. J Orofacial Pain 7(3):283-293, Summer 1993. 7. Curl DD, Shapiro CS. Head/neck pain: the need to identify the patient with acute versus chronic pain. J Chiro Technique 1(3):101-105, 1989. 11. Steigerwald DP: Acceleration/deceleration injury as a precipitating cause of temporo-mandibular joint dysfunction. ACA J Chiro., 26(11):61-64, 1989. 12. Steigerwald DP, Croft AC: Whiplash and TMJ Disorders: an Interdisciplinary Approach to Case Management. La Jolla, J.B. Media Int., 1992. 13. Frankel VH: Temporo-mandibular pain syndrome following deceleration injury to the cervical spine. Bull Hosp Joint Dis., 26:47, 1969. 14. Foreman SM, Croft AC: The Cervical Acceleration/Deceleration Syndrome. Baltimore, Williams & Wilkins, 1988. 15. Croft AC: Whiplash: the Masters' Certification Program -- Modules I & III. Coronado, Spine Research Institute of San Diego, 1992. 16. Schneider K, Zermicke RF, Clark G: Modeling of jaw-head-neck dynamics during whiplash. J. Dental Res., 68(9):1360-1365, 1989. 17. Howard RP, Benedict JV, Raddin JH, and Smith HC: Assessing neck extension-flexion as a basis for TMJ dysfunction. J. Oral Maxillofacial Surg., 49:1210-1213, 1991.